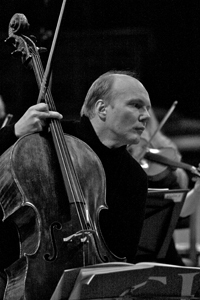 Truls Mørk's reputation as a cellist of fierce intensity and grace has been built on performances throughout the world. He is a celebrated artist who performs with the most distinguished orchestras, including the Berlin and Munich Philharmonics, Royal Concertgebouw, Philharmonia Orchestra, Orchestre de Paris, Staatskapelle Dresden, Symphonieorchester des Bayerischen Rundfunks, and Wiener Symphoniker. In North America he has worked with the orchestras of Boston, Los Angeles, New York Philharmonic, Chicago, and Cleveland, among others. Truls Mørk is a committed performer of contemporary music who has championed the cello concertos of Henri Dutilleux, Pavel Haas, Hafliði Hallgrimsson, John McCabe, Krzysztof Penderecki, Matthias Pintscher, Einojuhani Rautavaara, and Lasse Thoresen. He has made numerous recordings, mostly for Virgin Classics. In 2002, he received a Grammy Award for his Britten Cello Suites, and 2011 an ECHO Klassik Award for his C.P.E. Bach Concerti. He received the Sibelius Prize and the Norwegian Critics' Prize in 2011. Truls Mørk plays on the rare Domenico Montagnana ‘Esquire' (1723). His recording of Einojuhani Rautavaara's 2nd Cello Concerto for Ondine received a Gramophone Award in 2012 and the ICMA Award (International Classical Music Award) in 2013. Cello Concerto No. 2 "Towards the Horizon"